By all accounts, the George Daniels Horological Collection was an exceptional accumulation of objects demonstrating the skill and vision of one of history’s greatest watchmakers. The November auction, conducted at Sotheby’s in London, raised a total of over £8.2 million (Sterling), with proceeds of the sale to be added to the already-substantial bequest made to the George Daniels Educational Trust by the sale of Daniels’ motor-car collection earlier this year. Included were five of the watches he famously made by hand, representing a substantial proportion of the twenty-seven in existence (and at auction, presenting the only likely opportunity for a prospective collector to acquire one in this era). Also in the sale were four of the fifty Millennium Watches, a marine chronometer to Mercer’s specification, a Three-Wheel clock, sold to the watch company Breguet (and subsequently entered in their records as a Breguet creation) and a number of regulator clocks with the escapements converted to Harrison’s grasshopper by Daniels himself. Being one of the horological fraternity’s most anticipated events in a generation, the sale generated enormous interest. In the days leading up to the sale the preview was brimming with interested parties. Many of Europe’s most respected dealers and collectors could be espied carefully studying the artifacts while a good number of collectors specially travelled to London for the once-in-a- lifetime chance to examine and handle one of George Daniels’ revered watches themselves. The famous Daniels workbench, with its raised green top, was brought over from the Isle of Man and each tool carefully placed exactly as he had left it in an artful state of disarray, while fellow Isle of Man watchmaker Roger Smith was on hand to help guide visitors through the collection. On Tuesday 6 November, at the start of proceedings, the salesroom was heavily over-capacity. Bidders lucky enough to get inside had to jostle for space, there being barely room to open their catalogues. The auction was broadcast online with the progress being viewable on large screens throughout the building. 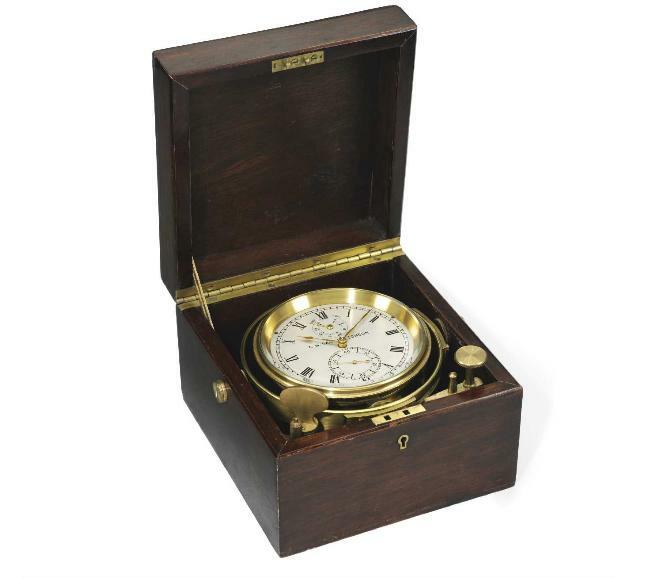 Lot 1 was Daniels’ first complete instrument of his own making, a marine chronometer from a kit of castings supplied by Mercer. George, who had no middle name, uniquely signed it ‘G W Daniels,’ preferring the typographically aesthetic balance that the invented middle initial afforded. Bidding on this lot quickly surged, with the hammer falling in little over a minute, bringing the total including premium to an astonishing £25,000. The pre-sale estimate was £2,500- £3,500; the rest of the sale broadly followed suit in terms of the high hammer prices vs catalogue estimates. Perhaps the most widely-publicised Daniels watch was always going to command the most interest and on the day it did not disappoint. 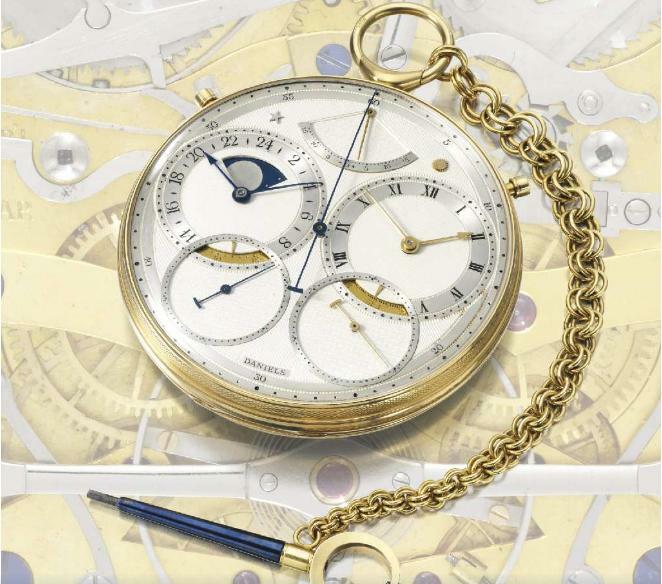 The memorably-named Space-Travellers’ Watch generated considerable excitement; bidders in the room vied with each other to own one of the 20th century’s most revered horological artefacts, imperceptible nods of the head incrementally nudging the price upwards in £50,000 quanta until it paused at just over one million pounds. The auctioneer managed to exact another hundred thousand from the pair before bringing down his gavel at £1,150,000 to discreet huzzahs and spontaneous applause by the crowd. The final price for the watch including premium was £1,329,250) (lot 9). This single figure smashes all world records for a) any Daniels watch, b) any English watch, and c) any watch made by an independent watchmaker. Bidding quickly progressed with the remaining hand-made watches all selling considerably above their estimates. 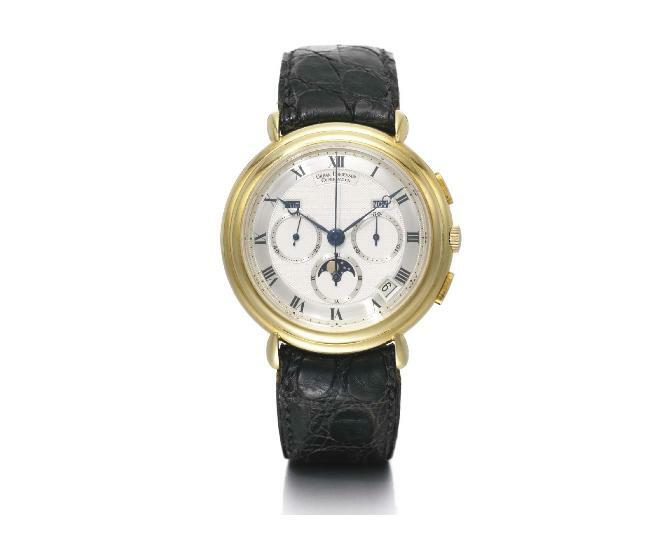 The opportunity to acquire a Millennium Watch was not lost and these also sold for high prices, especially the example in white gold commanding nearly £150,000. Another series of lots included commercial watches to which Daniels had fitted his own escapements and yet others that included watches presented to him by omega in recognition of his contribution. A Speedmaster Mark II, ca. 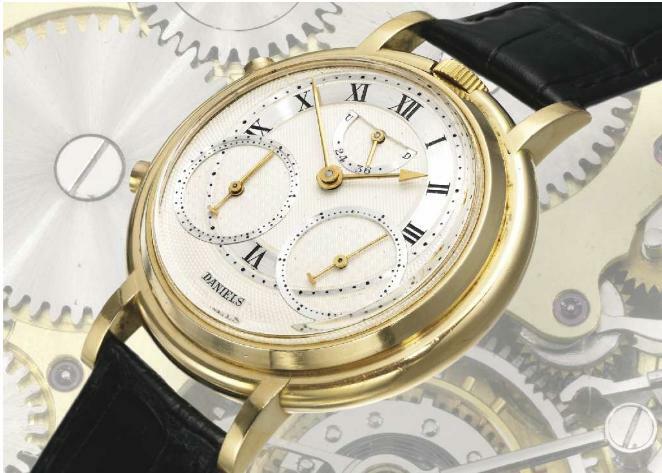 1975, fitted with a co-axial escapement by Daniels sold for £15,000. Ordinary watches of this type typically command about £800 (lot 19). The Jurgensen Museum took the opportunity to acquire an urban Jurgensen watch from 1985 fitted with the slim co-axial escapement (lot 22), paying £61,250 for it against an upper estimate of £20,000. 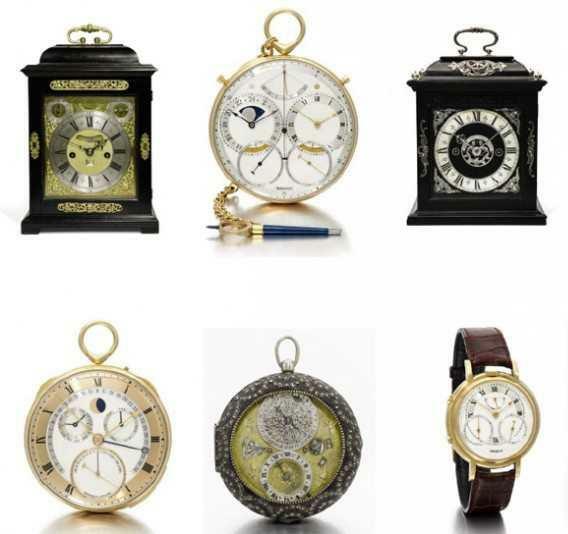 Never one to pass on an opportunity to acquire important horological works by other makers, Daniels had amassed a considerable collection of English and continental watches and clocks, and these items generated high prices as much for their importance in their own right as for their provenance. A British dealer and historian of the old school paid nearly £60,000 for lot 43, a beautiful pre-balance spring verge watch from 1650 by Benjamin Hill of London with astronomical indications and an exquisite piqué outer case. A ruby cylinder watch by Francis Perigal with ‘Chelsea-bun’ bimetallic compensation was a steal at £17,000, given its provenance with original bill of sale from Sam Clutton to George Daniels dated 28 June 1977. A magnificent Dent repeating carriage clock (lot 69) with chronometer escapement and original carrying case with a Bramah lock sold for £61,250. Horological oddities included a pantograph used by Breguet for inscribing their secret signature (lot 68) and a number of bronzes by various artists depicting Daniels himself. 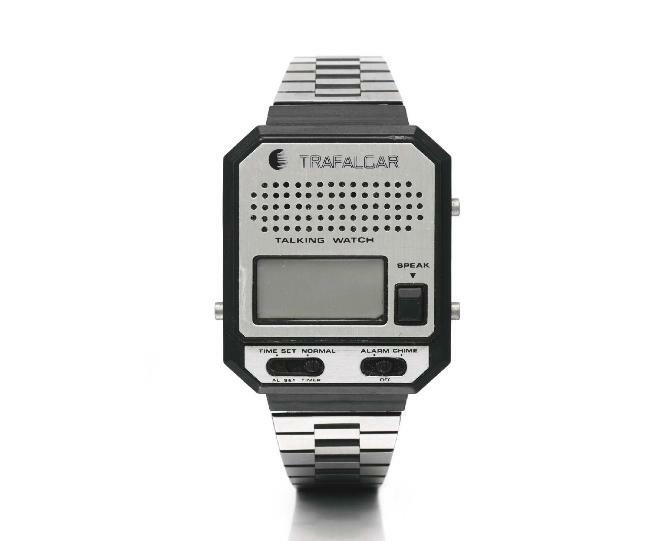 Never the snob, there were a good number of fun and quirky items in Daniels’ possession, such as lot 33, a ‘Trafalgar’ talking electronic digital wristwatch, commanding £813, whose price elicited about as many sharp intakes of breath as the Space Travellers’ Watch! The price of the German carved cuckoo clock that used to hang in the kitchen at Riversdale was the subject of quite a few private wagers and when the hammer came down its new owner had chalked up another couple of thousand Pounds for horological education. 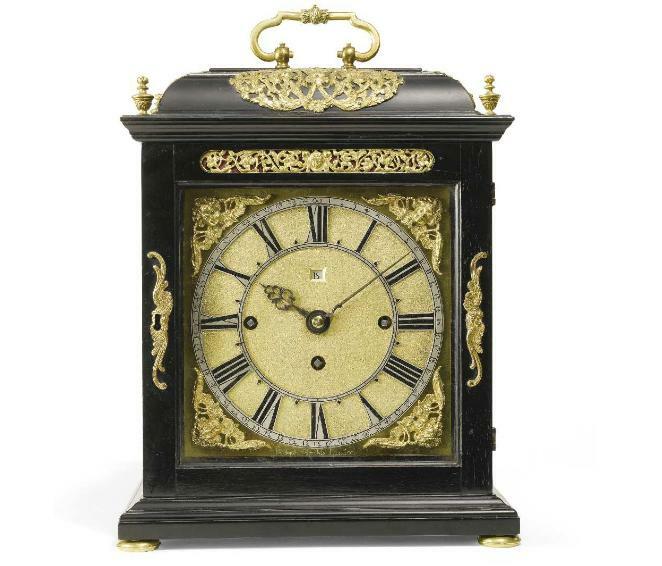 A collection of English clocks was crowned by a most beautiful and elegant little ebony Roman-striking bracket clock by Joseph Knibb (lot 130) with solid silver chapter ring, spandrels, case mounts and provenance linking it to king George III. Nobody should have been surprised when it finally sold for £1,273,250. The marathon session ended just before 6pm with the final proceeds totalling £8,285,139. This includes the 25% auctioneer’s premium. It is certainly the case that Daniels spent his life creating masterpieces of the highest order but it cannot be disputed that his business prescience always drove him to associate himself with only the best that his craft had to offer, as an historian, a craftsman, or as a collector. 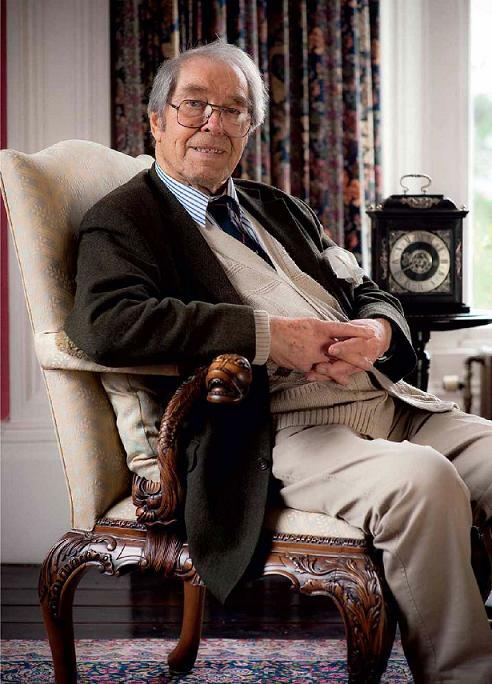 He will be remembered for the unstinting generosity of his magnificent bequest, which will finally bring long-term stability to horological education in the UK.